Income making active Horses Farm! Grossing over $168,000 annually.33 total Stalls. Contemporary custom built 1 owner home. First fl. features a spacious 2 story foyer, roomy master bedroom & master bath w/ double sink & garden jet tub, open dining area w/ vaulted ceilings leads to a gorgeous kitchen w/stunning South African Bubinga cabinetry & stylish Corian counters, 2 story Great room unique glass gas fireplace complete with Sony flat screen TV, 2nd bedroom or office space & half bath. Mudroom/Washroom with counters/cabinets, stainless sink, heated 3 car attached garage. 2nd fl. features a full bath, 2 bedrooms, Loft with stainless railings & 1st fl. views. Basement Rec. room, 2 bonus, laundry, utility rooms, full bath & wine cellar (450 bottle cap. )Secluded land w/ 115x240 horse barn, 68x240 indoor riding arena w/natural lighting finished observation room w/ heat/electric & break room below, 27 stalls, 2 tack rms - 2 hay rms - isle lockers - 2 wash racks. 22x22 . Out door riding Arena. 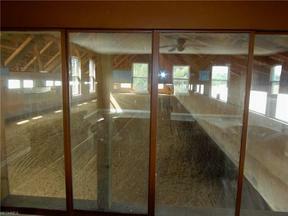 Refurbished original bank barn with 6 stalls. As well as a 32x65 storage building containing a 32x17 workshop. FREE GAS!! 600,000 cubic feet. All mineral rights transfer-some royalties. Other features, Cherry doors, Pella windows, security system, central vac, glass block windows, Gazebo, underground electric for troughs, high-tensile fencing, jumping field, Approx. 28 ac. hayfield & 22 ac. fenced pastures. New roof 2016, Furn. 2012. Appointment only No Trespassing. See Virtual Tours ! !